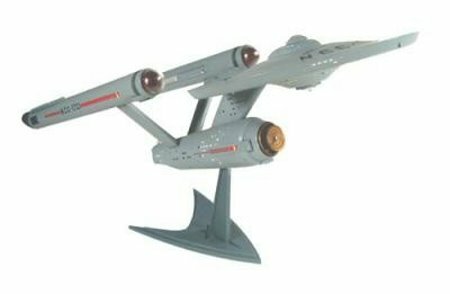 Polar Lights brings us a beautiful, accurate USS Enterprise from the original Star Trek. This is Kirks ship in all its glory. No more Ertl garbage! This one LOOKS like the real thing. The kit features over 50 parts molded in grey and clear plastic. You can choose to build the model one of three ways: The First Pilot version, the Second Pilot version, or the Production version. 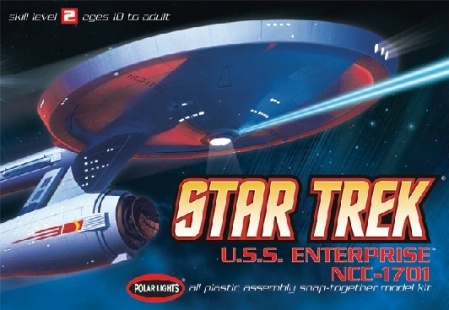 Waterslide decals allow you to decorate the ship as Enterprise, Constelation, Defiant, Exeter or even the Mirror Universe Enterprise. About the only thing missing is a light kit, but the ship is designed for you to add your own lights. When completed, this 1/1000 scale model will measure almost 12 inches. Buy 3! Buy 6! Build all the variations!